It’s with great sadness to write to you that Lyndia Lowy, a West Hollywood native and a Founding Board Member of the West Hollywood Preservation Alliance, passed away Sunday evening, Dec. 30, after a courageous three-year battle with cancer. Long involved in county-wide cultural affairs and historic preservation, Lowy, 69, graduated from Fairfax High School, the University of California at Berkeley (B.A), and George Washington University (M.A.) She was a long-time docent at the historic Gamble House in Pasadena, served as WHPA’s Board Secretary, sang with the Hollywood Master Chorale, was a member of the City of West Hollywood Women’s Advisory Board, and served as B’nai B’rith Western regional coordinator. 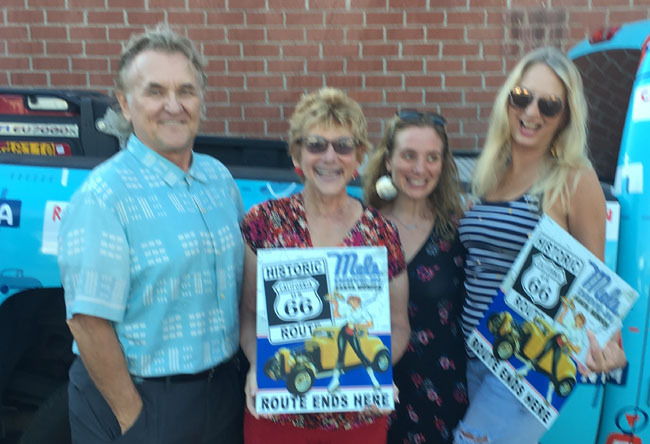 One of the last preservation events Lowy attended was a celebration of historic Route 66 on Aug. 3 in Santa Monica. The photo above shows Lyndia (second from left) with WHPA colleagues Victor Omelczenko, Amanda Bleich, and Lisa Koers. Her survivors include son Matthew and daughter Stephanie, several grandchildren, brother Arthur Rubinstein, and many, many friends. Funeral services are pending.